A roomy, refined and surprisingly dynamic large SUV, but mould remains unbroken. As the only large SUV on test this year, and Mazda's biggest car to date, the CX-9 stood out like a colossus in a field of mostly conventionally sized COTY contenders. Unlike Mazda's smaller five-seat CX-7 SUV, the CX-9 makes no attempt to play down its bulk, a point noted by Peter Robinson, who described it as "heavy; massive dimensions - designed for America". Dimensionally, the CX-9 is slightly longer, wider and taller than the 2004 COTY-winning Ford Territory, with the kerb weights of its simple two-model line-up coming in around 50kg lighter than the respective Ford rival. There's no denying that it's more stylish looking than the five-year-old Ford, however, with Sean Poppitt commenting that "it carries off the rakish zoom-zoom styling very well." The CX-9 backs up its bulk by providing accommodation that's the envy of its peers. Its roomy interior is attractive and well-finished, with an easy-to-navigate dash and a versatile seating configuration that has undoubted family appeal. Mazda's claim of best-in-class rear-seat accommodation is hard to argue with, especially when adults can sit back there in a modicum of comfort. When not in use, the third row folds flat into the cargo-bay floor, liberating a vast luggage area in the process. Like the majority of soft-roaders, the CX-9 is basically a FWD that's capable of driving all paws when required, via its Active Torque Split AWD system. It's also more on-road than off-road oriented, exhibiting superior dynamics to more purposeful 4x4s such as the Prado and Pajero. Judges were impressed by the smoothness of the 3.7-litre V6 and Aisin six-speed automatic, a combination that moves the CX-9's 2080kg kerb weight with impressive zeal, albeit with a reasonably heavy 13L/100km slug of unleaded in the process. Aside from fuel economy, the only criticisms of its performance focused on the amount of throttle required to get its mass moving again from a standing start, or out of a low-speed corner. Mass also became an issue in braking tests, where the CX-9 hauled up okay, but not brilliantly. 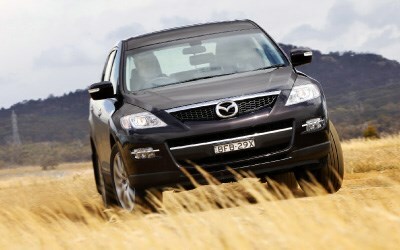 The ride, however, is commendable, thanks to independent front and multi-link rear suspension. NVH is also well controlled for the most part, the exception being a bit too much front suspension knock over potholes. The steering is light, and not overly endowed with feedback, but the ratio is decently quick and judges were mostly impressed by the CX-9's dynamic feel. "Very nice chassis balance; never feels like a lardy SUV," said Poppitt. "Surprisingly agile for its size," seconded Jon Hawley. Mazda's DSC stability program was not so universally praised, however, with most judges taking some issue with the manner in which it activated during testing. The system can be switched off, but reactivates at speeds above 15km/h. That's not a major issue in this style of vehicle but the tuning of the system was. "ESP a disappointment; very slow to kick in on dirt," noted Michael Stahl, a sentiment shared by Peter Robinson, who noted simply that the "ESP setting is un-Mazda-like". As a large and reasonably affordable seven-seat SUV the CX-9 makes a strong case against its established rivals. But with the possible exception of its additional interior space and superior refinement, it does not set any new standards and, as such, failed to gather enough support to progress beyond stage one.